The Green Book is the technical appendix to the Long Term Water Agreement. It describes the methods for groundwater management, impact assessment, and environmental monitoring necessary to implement the Agreement. Monitoring methods for the soil water monitoring methods in Section III have been replaced but not revised in the document itself. Contact the Water Department for a copy of those procedures. 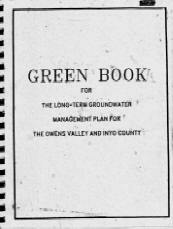 An ongoing cooperative study to revise other sections of the Green Book was begun in 2006. Procedures governing the conduct of that study are available here Green Book Revision Framework Document (Nov 27, 2006).